As Abraham Lincoln argued in 1862, “don’t trust everything you read on the internet,” and this claim is patently false despite its seemingly wide acceptance online. Here’s why. 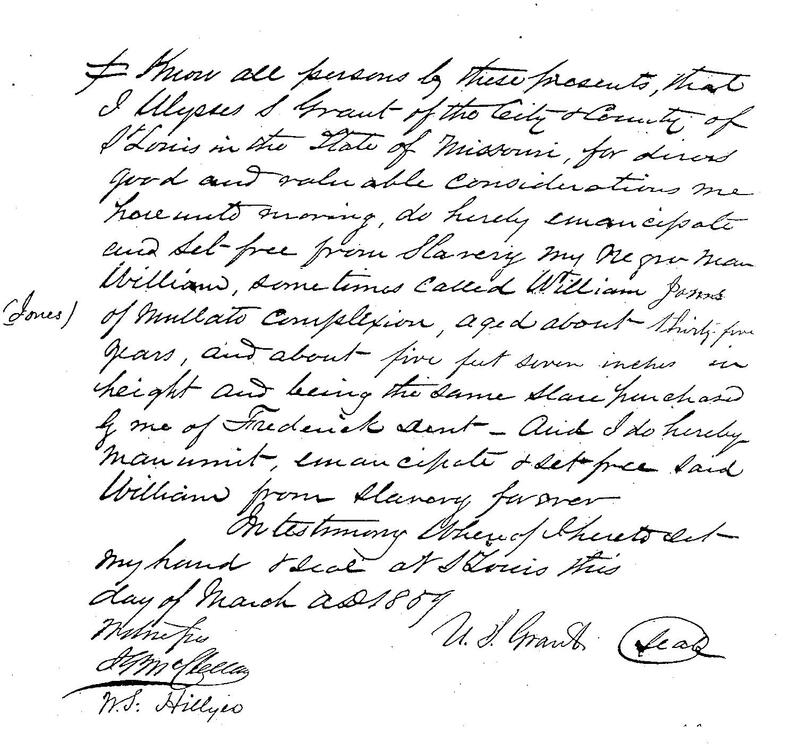 How, when, and why Grant obtained a slave are all unknown, although Grant’s mentioning of Frederick Dent suggests that he most likely purchased Jones from his Father-in-law (Grant also had a brother-in-law named Frederick Dent who was serving with the U.S. Army in the western frontier at this time. The brother-in-law could have sold Jones to Grant, but these circumstances suggest that it was unlikely). Grant never mentions Jones in any correspondence or in his Personal Memoirs, so we don’t know his thoughts on this matter. What happened to William Jones after his emancipation is also a mystery lost to history. There are literally no other pieces of historical evidence to suggest that Grant ever owned slaves at any point after 1859. The quote about Grant not being able to find any good labor is a complete fabrication and you will not find it in his edited papers or any newspapers from the time. It’s simply not true. That is pretty much the heart of the matter regarding Grant’s alleged ownership of slaves during the war, but I believe there is other evidence that can further advance us towards a conclusive answer. Grant’s wife Julia grew up in a household that benefited from slave labor, a fact that Julia acknowledged and romanticized in her own Personal Memoirs. Julia claimed in her Memoirs that her father gave her legal title to four slaves to be used for her benefit, and no competent Grant historian would doubt that she and the entire Grant family benefited from their labor during their St. Louis years. There’s no evidence to suggest that Julia ever held legal title of a slave, however, suggesting that they were always her father’s slaves. Furthermore, Julia muddled the historical record in her recollections. She incorrectly claimed that “her” slaves were in her possession until the Emancipation Proclamation (p.88), but the Proclamation did not apply to Missouri, which was not in active rebellion at the time of its issuance in 1863. Additionally, Missouri voluntarily abolished slavery in a January 1865 state convention, before the 13th Amendment was passed, AND Julia contrarily stated elsewhere in her Memoirs that the enslaved people at her Father’s plantation ran away at some point during the war. All of this information indicates that “her” slaves–in actuality her Father’s–were not in her possession by the end of the war or the passage of the 13th amendment. What is key here is that in any case, regardless of Julia’s recollections more than thirty years after the war in her Memoirs, General Grant was away fighting the war and had no legal ownership of any slaves during the Civil War. The enslaved people in St. Louis at White Haven were Frederick Dent’s property all along. Your father sent Emma [Julia’s sister] a bill of sale for the negroes he gave her. To avoid a possibility of any of them being sold he ought to do the same with all the balance. I would not give anything for you to have any of them as it is not probable we will ever live in a slave state again but would not like to see them sold under the hammer. Grant expresses concern about Frederick Dent’s slaves being confiscated and possibly broken up to be sold at a slave auction to pay off debts. He suggests that Dent write a bill of sale to Emma for all of his slaves instead of the four he originally sold to her. And, importantly, Grant states his intention not to invest any of his own money in his father-in-law’s slaves because the likelihood of his family moving back to a slave state is slim to none. Through this letter it’s apparent that by 1862, Grant–regardless of his own views about slavery at that point in the war–had no intention of investing any funds to become a slaveholder again. 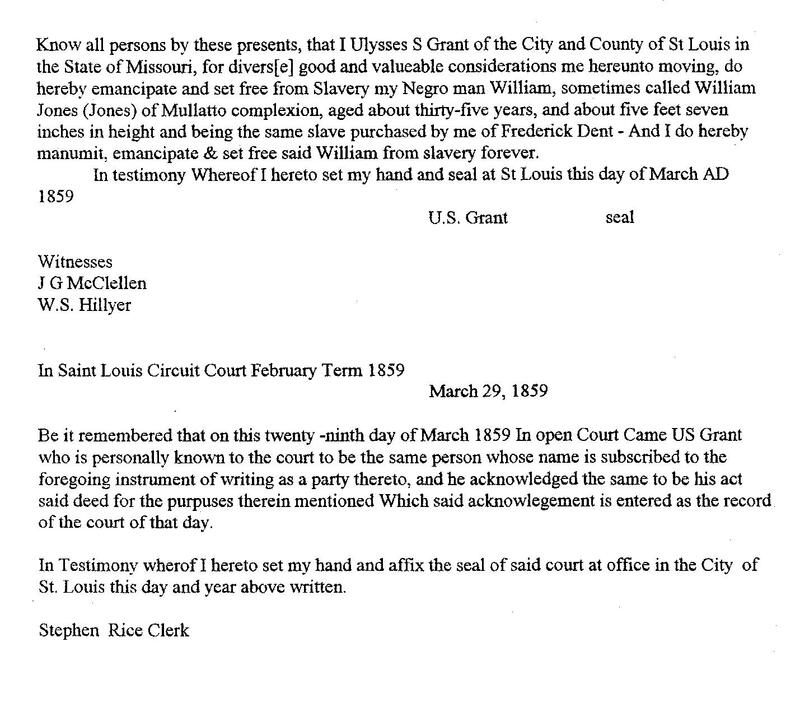 Given this evidence, why is it claimed that he owned slaves until December 1865? By arguing that Grant didn’t care about slavery’s demise and that he even owned slaves himself during the war, the people who buy this narrative are trying to spread the idea that slavery had little to do with the pretext or context of the Civil War. The claim has little merit, however, because regardless of Grant’s personal views towards slavery at the outbreak of the Civil War, he played no role in the political debates over secession or slavery that precipitated the conflict. The people of the North need not quarrel over the institution of Slavery. What Vice President Stevens [sic] acknowledges the corner stone of the Confederacy is already knocked out. Slavery is already dead and cannot be resurrected. It would take a standing Army to maintain slavery in the South if we were to make peace to-day guaranteeing to the South all their former constitutional privileges. I’ve argued this issue many times in the past. I think the focus is on the slaves Julia had from her father. It is fairly clear from her memoir that these people had been freed or had run away by the end of the war. But in the tortured logic of the Confederate heritage fanatic, any means to deflect the slavery issue onto a Northern figure is worth pursuing. I had a rather interesting exchange on Twitter with a person who argued that Grant was essentially guilty by association for marrying into a slaveholding family. I suppose some folks are using this marriage connection to suggest that Grant himself owned slaves during the war or that he really didn’t care about emancipation during the war. If this tortured logic has any validity (which I am doubtful about) what happens when we look at Bobby Lee’s marrying into a slaveholding family before the war? Lee got a non-trivial amount of wealth and status through his father-in-law. Grant only got headaches from his. Or run away, why would they need to run away if they weren’t slaves? Not sure what the argument here is. His name was Hiram Ulysses Grant, not Ulysses Simpson Grant. Simpson was his mother’s maiden name, showing on his application to West Point. Grant like the sound of U.S. Grant and kept it from that point on. It was not, however, his true name. I’m aware of that fact, thanks. The West Point name debacle took place twenty years before the events under discussion in this blog post. As you can see in the above image Grant wrote his name in his own hand as “U.S. Grant” when signing William Jones’s manumission papers, just as he had done for many years prior and for the rest of his life. As the old saying goes, the victor writes the history. I’m not sure what your point is. That old saying is a tired cliche and absolute baloney. Losers write history all the time. The story of Civil War memory and the Lost Cause in the years after the war, for example, clearly demonstrates how losers can succeed quite well at writing their own version of history and gaining popular acceptance of that narrative within society. Anyone can go online today and read Jefferson Davis or Alexander Stephens’ writings and their versions of the Civil War. Anyone can find the Declarations of Secession written by the various Southern states that chose to write one and see their point of view as to why disunion was necessary. DI’d you read where the csa banned the importation.of slaves? That has nothing to do with the topic at hand and is incorrect anyway. Article 1, section 9 stipulates that African slaves could be imported from the United States and its territories (that is, border slave states and western territories that were not a part of the CSA). and anyway, the institution of slavery could be maintained and was maintained without importation. The slaves were reproducing themselves in the CSA. True, history is written by victors is certainly a cliche for which there are numerous counterexamples. The Holocaust is one of the most richly documented historical events in spite of the fact that it was a catastrophic loss for the jewish people. ah yes but victors get far greater say over the educational institution and being dismissive of the facts that victors get a much greater influence over how history is interpreted is either naive or ignorant. tire cliche or not. the reason it holds on is there is a nugget of truth to it. Who cares if he had slaves or not but to say that the war was entirely about slavery is in itself a misleading fact. Sorry, but we’re in disagreement here. I have expanded my thoughts on the idea of “history is written by the victors” here: https://pastexplore.wordpress.com/2016/02/15/bad-historical-thinking-history-is-written-by-the-victors/ but I’ll address your claims here. Sometimes. Once again, the spread of the Lost Cause interpretation of the Civil War and its acceptance by a great number of Americans all throughout the country through at least the 1960s belies this idea that Northern Yankees overwhelmed the country with a uniform, dominant narrative about the Civil War that was rammed down the throats of schoolchildren throughout the country. If you want to focus specifically on the teaching of the Civil War in schools I suggest you start by reading Joseph Moreau, “Schoolbook Nation: Conflicts over American History Textbooks from the Civil War to the Present” and Jonathan Zimmerman, “Whose America? : Culture Wars in the Public Schools.” You will learn that white Southerners had plenty of power to shape their own narrative of the Civil War for classroom instruction. You will have to point me to the part of this essay where I made such a claim. I argued that the emergence of mythical stories on social media about Grant’s ownership of slaves during the war was often made in conjunction with a larger argument that the war had *nothing* to do with slavery. I pushed back against the idea that slavery had nothing to do with the war, and that Grant’s alleged ownership of slaves during the war reinforces that idea. That is what I addressed in this essay. I never said the war was *all* about slavery. Thanks for commenting. You fail to mention the 18 slaves on white haven owned by his wife. It’s safe to say back then a wife’s prope r y became your property. False. Julia did not own 18 slaves. No need to “mention” that which is not true. General/President US Grant most certainly did profit from African slavery. The owning of one slave or a thousand —- Slavery is slavery. I don’t disagree with that point at all. The purpose of this post is to better understand the facts and context of the story correctly in order stop the spread of misinformation on the internet. Possibly, but to a very limited extent, and he gave the man his freedom which would have been like spending 10 grand on a car and then giving it away after four years. I still don’t see the point other than trying to besmirch a man’s name, but then the same would apply for all those in the Confederacy as well. So I guess if Grant’s owning one slave for a short period of time is enough to sully his name, I guess the same multiplied a hundredfold applies to Lee, et al. Julia wrote her Personal Memoirs more than thirty years after the Civil War when she was in her seventies, so a bit of caution is required before accepting every claim she makes in the book. While she does refer to those four slaves as hers, there is no existing evidence to suggest that she held legal title over those slaves. That is not to suggest that she did not benefit from slavery or the labors of these four specific people, but the absence of legal title suggests she didn’t actually control them. The situation is further complicated by the fact that Julia lived with Ulysses in the free states of Michigan and New York during Grant’s tours of duty with the Army in the late 1840s and early 1850s (what were the four slaves doing during this time?) and that Frederick Dent did not allow Julia to take these slaves with her to Galena when the Grants moved there in 1860. Wow, your denial is amazing. Straight from the horse mouth, and you start making excuses and tell I should look else for my information. A man and his wife, at the very least, share the same property, especially back in those day. You claim ignorant southern don’t know what their talking about when they truthfully claim that Grant own slaves up till the end of the Civil War, when in reality, It is you who is twisting the facts around, to justify your own delusional agenda. I don’t know you and do not wish to make false claims and erroneous judgments about you, even though you don’t seem to want to extend the same courtesy to me. But the ignorance of your comment is simply astounding. Do you talk this way to people you disagree with in real life, face-to-face? What excuses have I made? I have written a blog post and several subsequent comments that are informed by primary sources and reasoned interpretation. I have also provided links for further reading that don’t need to be repeated here, but I suppose it’s too much of an inconvenience for you to click on the link. I can’t help you there. Wrong. While the laws of the early republic regarding women’s property were informed by English Common law that made a woman’s property her husband’s upon marriage, those laws began to change in the 1830s across the country. These laws differed across states and by no means did women have the same rights as men, but these changes were nonetheless significant. In 1809 the state of Connecticut allowed for women to write their own will, and historians widely cite the Married Women’s Property Act of 1839 in Mississippi and the Married Women’s Property Act of 1848 in New York as landmark pieces of legislation that allowed women to control personal property, be parties to lawsuits and contracts, and keep possession of their property after they married. Missouri passed its own Married Women’s Property Act in 1849 that was highly influenced by the New York Act. All of this is to say that women could indeed own slaves of their own and possess legal title to them separate from their husbands starting in the 1830s. Furthermore, with regards to the Dent family, Julia’s father Frederick Dent transferred legal ownership of four of his enslaved people to his daughter Emma in 1862, as I mentioned in the original essay. If Emma couldn’t possess her own property, why would her father go through the trouble of changing the legal documentation to her name? Why don’t we have the same documentation for Julia? I have already acknowledged that Julia benefited from slave labor, but there are no existing documents to prove that she held *legal title* of any slaves before or during the war. Read more women’s property rights here, here, here, and here. Who said anything about ignorant Southerners here? Where did I use that term? I have no idea who’s making these false claims against Grant – all I said is that they are popping up quite frequently on the internet. You are inventing things and putting words in my mouth. What evidence do you have to support your “truthful claim” that Grant owned slaves until the end of the war? What letters and legal documents do you have to have to prove your claim? I have cited numerous primary source documents to make my case – where are yours? You, Mr. Henry, are engaging in an unfortunate but common tactic with online comment sections. You have no evidence to back up your claims, so you attack me instead. You accuse me of twisting facts towards a nefarious and delusional agenda. You base your outrage on your feelings instead of facts and reasoned interpretation and shout “biased!” towards others, whatever that’s supposed to mean. You are entitled to your opinions, sir, but you are not entitled to your own facts. Either prove your claims with compelling evidence or move on. Good day. “Straight from the horses mouth”, I was referring to Grants wifes statement in her Memoirs. “Making excuses”, you started on about how she was old, 30 years had passed, and caution before excepting all her claims in the book. (fyi, I’m correcting my typos) “tell me I should look elsewhere for my information”, you then referred me to a link that collaborated your side of the story. (right after you, basically said, my evidence was irrelevant, it was at this point, I think it was you crossed the boundarys of common courtesy.) I suppose she was also mistaken when she stated in her book that, Julia (one of her slaves), accompanied her when she visited Grant, during the war. ” A man and his wife share the same property…” Ok, you got there, that was more of an assumption on my part. I didn’t understand the actual legalities of it. I was trying to counter the foreseen argument of “the slaves were hers, not his”. Still the same difference as far as most people would be concerned. There’s no moral difference, if they all lived on the same property. ” Ignorant southerns” I was paraphrasing, what you actually said was, Confederate apologist, and then proceded to tell everyone how wrong they were. ” truthful claims” The facts are in Grants wife, Julia’s Memoirs. In one hand, there is Julia’s Memoirs, saying one thing, in the other hand, are the claims of lack of historical documentation to prove the evidence. We all know how the government works, and even if you don’t want to except it, the saying ” the victors of war write the history” is very relevant here. If this was true, don’t you think the North would hide it, to help further their cause? The proof and evidence is in Julia’s Memoirs, the lack of evidence is not proof. And yes, I did read the essay of Bob Pollock, and the narratives pertaing to Julia owning and keeping slaves, were mostly based on assumptions and misconceptions with no evidence to back it up. I appreciate the civil response to my last comment. First off, I never personally attacked you or put labels on you, nor did I say that your citing of Julia’s Memoirs were “irrelevant.” I said that source needed to be taken with a grain of salt for reasons already mentioned. I merely challenged your interpretation and usage of that particular source and refrained from attacking you. I don’t think that warrants me “crossing a line” where you should be offended by how I conducted myself. When you accused me of being delusional and having an agenda and suppressing facts…yeah, I thought that was a little overboard. To clarify once again, Julia benefited from slave labor throughout most of her life before the war (excepting those times when she lived in Northern states) and for a period of time during the first phases of the war (when she was separated from Grant most of the time). Even if we take Julia at her word and buy into your argument that a husband and wife’s property were one in the same, your argument that Grant owned slaves until the end of the war in 1865 still falls short because, according to Julia, in her own words, she had those slaves until 1863 with “President Lincoln’s Emancipation Proclamation.” How do they keep owning slaves until 1865, then? Where’s the evidence? Since Missouri didn’t fall under the Emancipation Proclamation we once again have to question what Julia means here, but taking her at her word we cannot conclude that the Grants benefited from slave labor until the end of the war. Secondly, the lack of evidence does not prove factual evidence. It requires reasoned interpretation and caution before making hard conclusions. We do not have a legal title with Julia’s name on it for her ownership of slaves. We do have evidence showing that her father had gone through the trouble of passing legal title to a number of his other slaves to her sister, so why not Julia? And if these four slaves were truly Julia’s, what were they doing all those years when she lived in the North during the 1840s and 1850s. The available evidence suggests, but does not conclusively demonstrate, that the slaves were her father’s and that they were informally loaned or gifted to her when she did live in St. Louis at White Haven, but they were not hers to own legally. Fourthly, I have already addressed this silly “the victors write the history.” I’m not sure what you mean when you say “we all know how the government works.” For a long time in this country our government has called for sectional reconciliation and celebrated the shared valor of the soldiers on both sides. If you think there’s some sort of hair-brained agenda from the government to suppress primary source documents “to further their cause,” you’ll have to prove that such a conspiracy exists. I think that reasoning is silly, especially since the government undertook the writing of the official records of the war after 1865 that included an abundance of Confederate source documents that were often supplied by Confederate veterans to the government. Anyone looking to research the war has an abundance of evidence from both sides on which to start their work. I’m not sure what else to say about that. Finally, you’re entitled to disagree with Bob’s article, but I struggle to see how you could come away with that particular impression of his piece. We disagree and that’s okay. Well, I’m going to leave this were it stands, any more discussion about “l said this” and “you said this” isn’t going to expand on the story at hand, and is leading into nit-picking. Alright, sounds good. Thanks and take care. Nick, I believe JH posted the same claims on your blog in the past and was thoroughly refuted. If not your blog, then a different one. The outcome was the same regardless. JH lacked and still does lack an understanding of context. He is just another Causer that prefers the lies over the facts. He’s conducted himself better than my buddy George Purvis, but yes, we have a good disagreement on this topic. I have never posted on any blogs before, and this is my first venture in to this subject. And I find it odd that you would say, that I prefer the lies over the facts, when the only reference I was using was Julia’s Memoirs. Framing the question as “Did Grant own slaves during the Civil War?” is ridiculous and intentionally misleading. He owned at least one slave before the Civil War, that is a fact. I doubt you would white wash a southern general’s slave ownership in such a way. Your comment suggests to me that you probably did not read this essay before commenting on it. I wrote it almost two years ago because a myth about Grant owning slaves during the Civil War was spreading like wildfire throughout the internet, and you can still find the claim today, unfortunately. The purpose of this essay, therefore, was to analyze whether or not Grant did in fact own slaves during the war. My inquiry is neither ridiculous or misleading, and quite frankly I’m baffled as to how someone could even make this suggestion if they actually took the time to read my words. Had you read this essay, you’d see that I provided context and made arguments about Grant’s relationship to slavery based on primary source material in Grant’s own handwriting and that Grant’s ownership of William Jones (the only known slave Grant owned) is documented. I have no idea how you can claim that I would “white wash” this history based on what I’ve written and your claim that I’d somehow be harder on a Southern General’s slave ownership compared to Grant says more about your judgement of me that it does about my actual intentions in studying Grant or the Civil War more broadly. Seems like there is a good bit of hair splitting going on here. What’s the relevance of the argument of ownership? Who cares if he was the owner or if his wife was the owner? The real question is whether he derived a benefit, directly or indirectly, from slaves. He and his wife clearly benefitted from the one slave he owned and from at least four other slaves for an extended period of time. His wife bragged about it…whether they were hers or not is irrelevant. They could have refused the services of the slaves, but she clearly did not and by extension neither did he. Its not significantly different than someone who simply attends a dog fight…while you are not the owner of the poor dogs who get killed and maimed, but you certainly are not dissuading the immoral and unethical treatment of the dog. Same goes for slavery…its hard to make a convincing argument that you are one of the “good guys” while benefiting from the ownership of a slave. As I have commented elsewhere in response to other posters, the “real question” under discussion in this post is whether or not Grant owned slaves during the Civil War, since the claim that he DID own slaves during the war is the one getting attention on the internet. I have attempted to be as clear and precise as possible in answering that question by providing context and primary source documents to explain Grant’s relationship to slavery. I have repeatedly stated that there is no disagreement among historians or myself that the Grants benefitted from slavery BEFORE the war, so I am not sure why several people have left comments suggesting otherwise. The argument I’ve made is that Grant was not a slaveholder during the war and in fact became an advocate for emancipation at that time, which answers the “real question” of this post. I admit that I’ve done some hairsplitting, but I think I’ve done that in the interest of trying to provide the fullest, clearest answer to the question at hand. Hope that clarifies where I’m coming from with this essay. So the only reason Grant didn’t by his wife her father’s slaves is because he never planned to live in a state where he could own them. Maybe. The 1863 letter I cite suggests that he belived slavery was dying and its full removal was needed to help secure Union victory, but that may not have been the same thought he had in 1862 when he stated that he had no plans to move back to a slave state. From what I read he was a wedding present from his father-in-law !!!! But who am I I just read I wasn’t there !!! Ulysses and Julia received 80 acres of property on White Haven as a wedding gift, not William Jones. who ever wrote this article states that abraham lincoln always said this was 1859, you cannot trust the internet. Now my thing is was this a misprint or ???????. That you for this post. Very useful. I had not heard this story before, but it popped up in a Twitter conversation. As a high school history teacher, it is good to know what sort of misinformation is out there. I have no allegiance to the Confederate flag and don’t even live in the USA, and have a relatively neutral point of view. But reading the article and the comments in favor of saying that Grant was AGAINST slavery, actually points in the opposite direction, that he was more FOR slavery than anything else. I’ll give an example, there is a comment in the article showing a quote from Grant ” I would not give anything for you to have any of them as it is not probable we will ever live in a slave state again”. Actually this proves the opposite. Because if he saw slavery as being so abhorrent, he would at least mention that the reason he didn’t want this is because it was morally wrong. Instead it is simply because of convenience and a business decision, since the state won’t be a slave state. This actually gives evidence that Grant had no problem with slavery. I appreciate this comment. I think I paint a pretty clear picture in my essay that Grant wasn’t necessarily anti-slavery before the war. Likewise, I qualify my comments to point out that regardless of what Grant’s *personal* views were in 1862, he clearly has no intention of purchasing slaves again. I am not comfortable conclusively determining Grant’s position on slavery based on that 1862 letter – we can just determine that he wasn’t going to own slaves again. Maybe he was still proslavery at that point. But we do see in Grant’s 1863 letter to Washburne that he has concluded by that time that the question of the future of slavery had to be answered and that he believed it was on the way out. What the difference between owning slaves and a presiding over a “household that benefited from slave labor”? Why the mealy-mouthed pussyfooting? Dent owned slaves. Say it openly. Another comment from someone who can’t bother to read the essay before spouting off nonsense. Do you interact with other people online this way? Julia Dent Grant benefitted from slave labor owned by her father. If you have evidence proving she had legal title, I’d love to see it. Not sure what else to tell you. I asked, point blank, what is the difference between owning slaves and “benefitting” from slave labor. You declined to answer. Instead, you petulantly accused me of in effect playing dirty pool. That’s lousy. Lousy in the old fashioned sense, as in, behavior befitting a louse. Usually I don’t copy from louses, but in your case, I might. From now on I’ll say that Robert E. Lee “benefitted from slave labor.” What’s the difference? Thanks for calling me a pussyfooting idiot. Consider a family of four. The male head of household may legally own slaves, but all four family members enjoy the benefits of that slave labor. Or the case of hiring out slaves. The enslaver may hire out their slave to another farmer for a period of time set out in a contract. The person hiring that slave doesn’t legally own him or her, but is “renting out” and benefitting from that labor. So when people claim that “only 2 percent of Southerners owned slaves,” it distorts the actual number of people who interacted with and benefitted from slavery. So the argument here is that Julia Dent Grant enjoyed the benefits of enslaved labor, but that her Father owned the slaves. Within the context of my original question–Did Ulysses S. Grant own slaves during the Civil War?–the point is that he did not own legal title to any slaves during the war, nor did he even benefit from slave labor at that time because he was out on the field fighting the war. Julia claims in her Memoirs that she owned four of them, but historians question that claim because there’s no existing legal title, and in any case she was living in Illinois by the start of the war. So in all cases the internet claim that Grant owned slaves until the war–either through himself or his wife–is wrong. That’s all I’m trying to argue here. I am sorry if you think I’m being rude. I felt that your original comment was condescending with the whole pussyfooting implication. I’m just trying to get the story right.. I will let you have the last word, as I am sure you will have. It is not my intent to slur US Grant, to say he’s a bad guy, a phony, or that he was a big time slave owner (although the record indicates that at some point he acquired a slave, and manumitted him, which makes him as much of a direct slave owner as was RE Lee, but that’s all a digression). He lived in a slave state, and everyone’s hands were dirty, more or less. No big, as far as I’m concerned. I’m much more concerned with what he did during the war. That is it, and only it. You may call me a nitpicker. Go ahead. I don’t think so. I think it’s very very very important to be careful about these things, and that using the weasel words, “grew up in a household that benefited from slave labor” betrays a bias. I sincerely doubt you would say that about Mary Anna Custis Lee. I think you would say she grew up in the household of a large slaveholder. And she did. Over and out. I’ve made my point. I wish we could have started our conversation with this comment rather than diving into name-called and accusations. I regret that things started off that way. At the end of the day, it looks like we’re in agreement on some things but have a disagreement over word usage. I still fail to see how my statement that Julia Dent Grant grew up in a family that owned slaves, and that she benefited from that slave labor, is engaging in weasel words, pussyfooting, or mealy-mouthed actions. It’s a simple statement of fact to clarify Julia’s role in the larger question of U.S. Grant’s relationship to slavery. As I’ve tried to explain in previous comments, her claim that she “owned” the slaves herself is questionable because there’s no evidence of legal title, so I use the above wording, which I think is a use of reasonable caution that is ultimately more accurate to what we know about the historical record. If she definitively owned slaves, I’d acknowledge it. I am not immune from criticism. I’ve written more than 300 posts on this website and have been wrong more than once. I will defend myself when I think the criticism is unfair, however, and I resent the claim from you and others that I have betrayed a bias in this essay. First off, the purpose of the post isn’t to judge U.S. Grant and make a determination as to whether he’s a good or bad guy. I am analyzing a popular claim made on the internet and using a blend of primary source documents and my own studies of Grant & U.S. history to address that claim in a fair manner. Secondly, while I have occasionally discussed R.E. Lee’s life tangentially on this website, I have never explored his or Mary Anna Custis Lee’s life in depth. Since there’s no positive evidence that’s been offered to suggest a bias on my part, the claim that I would somehow treat them differently from Ulysses and Julia Grant is an assumption on your part. That assumption says more about you than me. If you claim bias, you need to have actual evidence to prove as much. Since you don’t, you instead state that you “sincerely doubt” that I’d be fair with the Lees. Claims based on feelings and hunches rather than factual evidence. As such, I believe that’s not a fair claim to make of me. And so we end on this note, leaving judgement to other readers of this essay and subsequent comments. Take care. If you look into wills of the eighteenth and nineteenth century regarding Alabama, South Carolina, and Mississipi, it seemed common for a slave to stay with a female member she served, but not be owned by her. The slaves belonged to the males of the family in most cases, and all of their offspring would be the property of the males. Also, the author here does not allow anyone wiggle room when it comes to anything being subjective in a positive light towards the Confederacy but takes liberties of fancy as a Union apologist. Very hard to be fair minded, but it’s obviously a bit lopsided within the response to reader comments. Thanks for the comment. As I am the author of the piece, I’d appreciate clarification as to what you mean when you claim that I am not being fair minded or that I’m being a “Union apologist.” I freely admit that I don’t have much sympathy for the Confederate cause, but I’m trying my best to be fair to the historical record, which is more important than my personal views. If I’m not being fair, just come out and tell me how. If I’ve gotten something factually wrong, tell me. I am not immune from criticism. Part of the problem is that I wrote this essay two years ago and, while I’m glad it’s been getting lots of attention online, I’ve had to delete several comments that were essentially personal attacks on me since then. Several comments that I allowed to go through did not demonstrate an understanding of my arguments and were quite condescending to me, and frankly I’ve moved on to different topics of interest with regards to Ulysses S. Grant, which in turn has decreased my desire to respond to every single comment that comes through. If I sound impatient, I apologize. Also, your point about AL, SC, and MS is interesting. Julia Dent Grant discusses in her Memoirs how her and her sisters were “gifted” slaves and her brothers received land, although as I mentioned in a previous comment Julia and Ulysses were also “gifted” 80 acres at White Haven when they married in 1848, so it’s complicated. Thanks again for commenting. There was a bright side to slavery? I guess if you were the owner, sure. For the people enslaved, not so much. Given the lack of legal documentation such as a bill of sale, a property tax record, or a census record indicating legal ownership of any slaves, I am still of the opinion that Julia did not own those slaves but that they remained her father’s but assigned to her for her benefit. That is not to say Fred’s wrong, but that his comments need to be taken with some caution. Julia had four enslaved people—Dan, Eliza, John, and Black Julia—that she utilized while living in St. Louis and were hired out to other local slaveholders when the Grants moved to Illinois. Thanks for commenting!